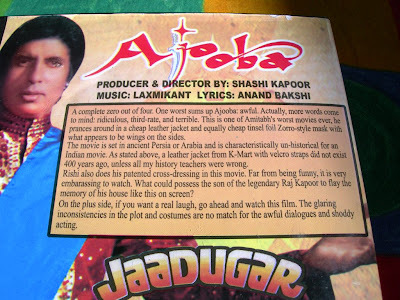 Alert reader Temple sent me this photo of the hilarious and scathing review of Ajooba that is featured on the back of the case of her copy of the film. With marketing like this, who needs enemies? For those who do not wish to squint, the text is identical to a user review on imdb (bottom of the page here), helpfully titled "One of the worst all-time Hindi movies ever." Happy Monday, everyone! I hope your day reaches at least one out of four. Ajooba and Jaadugar in the same box? Oh my. That's some fine Bachchan cheese right there, yessir. At least that blurb makes me want to see the movie (for all the wrong reasons). Some of the synopses on Netflix are particularly scathing. Of course the vast majority either make no sense or give away all but the last 10 minutes of the movie. Vishal - I must see Jaadugar. Also please pat me on the head for being able to translate that title without looking! I want to know more about the Bad Bachchan Years. "Ajooba hangover...I don't want to get over!" I remember going to a Christmas party and watching this movie with other kids who shouted themselves hoarse cheering for Amitabh and the dolphin! LMAO!!! That review was AWESOME!! !